Two inboard engines, 350 cruisers with 900 hours on them - both run great. Nice big deck and roomy below deck. 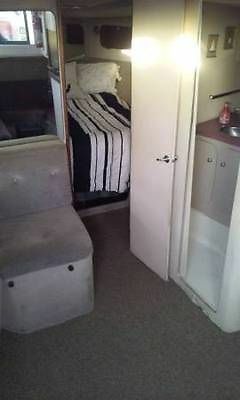 Sleeps six, forward berth and big aft cabin, bathroom with toilet and shower. Lots of closet space, air-conditioning and heater both in good working order. 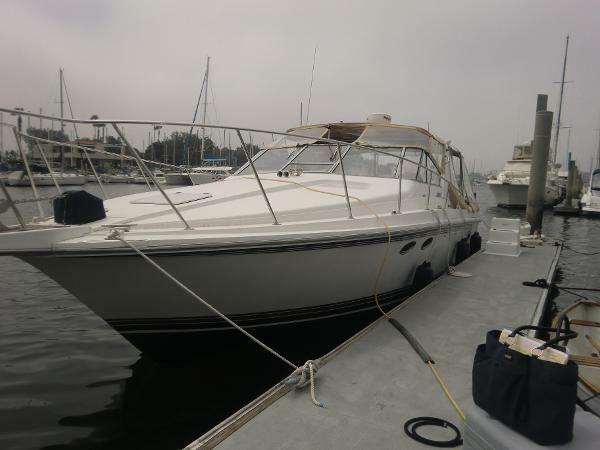 Needs some TLC, but is definitely a great boat for taking out to Catalina or cruising up and down the coast. Please email with any questions. The overall condition of the vessel is good. The hull gel coat was bright with no chips, gouges or cracking detected. The upholstery was found to be clean and in good condition. The current water heater tank does not work. Seller is scheduled to replace it. The canvas and sides were found to be clean and good condition. Engines, generator and air conditioning were not run because the boat was stored inside at the time of visit. The seller states the engines run great. 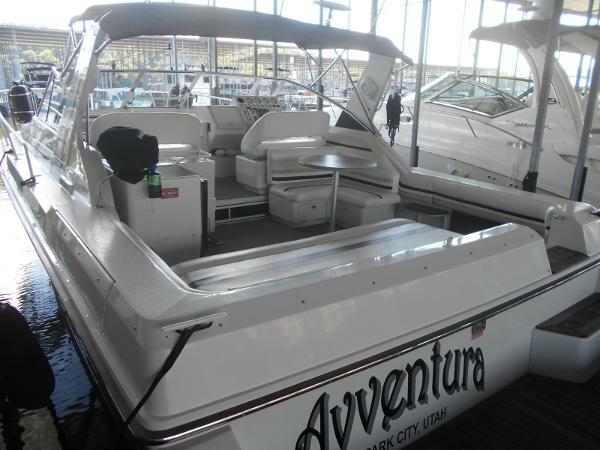 Stock #172960 Powered by twin Chrysler 440's, Large Aft Cockpit, Full Bridge Enclosure, Well Maintained, Ready to Cruise! 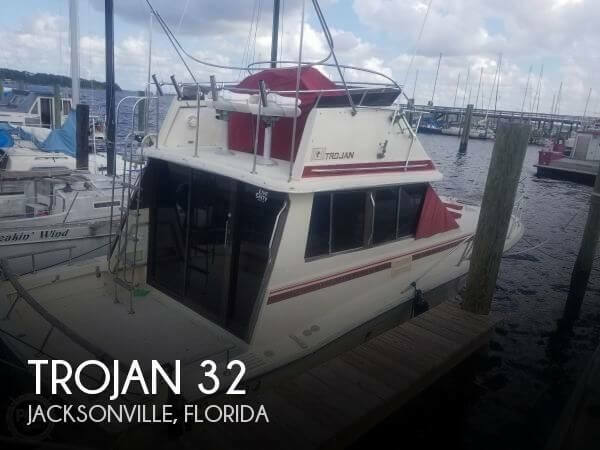 If you are in the market for a sportfish/convertible boat, look no further than this 1980 Trojan 36 Convertible, priced right at $33,400 (offers encouraged). 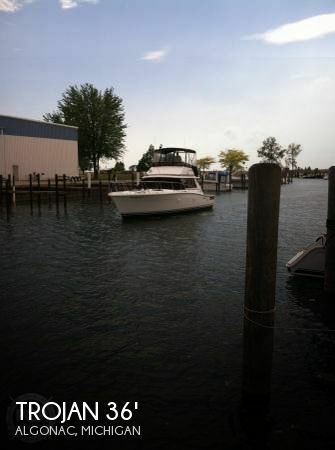 This vessel is located in Algonac and is in good condition. She is also equipped with twin Chrysler engines that have 1,439 hours. In June of this year (2018) this boat had a ton of work done (over $20K - invoice available upon request). Work included: - Exhaust manifolds, risers, elbows, and all 3" exhaust hoses; - Replace rudder, props tuned, shafts tuned, and engines aligned; - Engines tuned with new dist. caps, plugs, points; - Change oil, oil filters, and fuel filters; - Replace raw water pumps, hoses, and belts; - Install a new through-hull transducer; - New bottom paint and zincs. This boat is in great mechanical/operational condition. Don't miss this opportunity to make this Trojan F32 Sedan yours. Stock #164009 Nice Condition Trojan F32 Sedan!! Sleeps Up To 6!! Many new upgrades! Ready to Cruise!! If you are in the market for an express cruiser, look no further than this 1984 Trojan F32 Sedan, priced right at $33,400 (offers encouraged). This vessel is located in Jacksonville, Florida and is in good condition. She is also equipped with twin Crusader engines that have 700 hours. Reason for selling is moving to a center console fishing boat. 1984 Trojan 10 Meter 1984 TROJAN 10 METER WITH TWIN 350 CRUSADERS 790 HOURS AWESOME FOR FISHING, ENTERTAINING OR JUST CRUISING!! This is a cruiser that crams a bunch of space into the 33 hull. Sleeps 6. Many new and recent upgrades throughout. Engine and transmission are smooth and run flawlessly. This boat has been meticulously maintained. The appeal of this boat rested in its roomy accommodations, handsome lines and affordable price. Nice 13 beam for comfort. And check out the Trojan fiberglass hull, one of the best in the industry. 1987 Trojan 10 Meter 1987 TROJAN 10 METER WITH TWIN 350 CRUSADERS 790 HOURS AWESOME FOR FISHING, ENTERTAINING OR JUST CRUISING!! This is a cruiser that crams a bunch of space into the 33” hull. Sleeps 6. Many new and recent upgrades throughout. Engine and transmission are smooth and run flawlessly. This boat has been meticulously maintained. The appeal of this boat rested in its roomy accommodations, handsome lines and affordable price. Nice 13’ beam for comfort. And check out the Trojan fiberglass hull, one of the best in the industry. 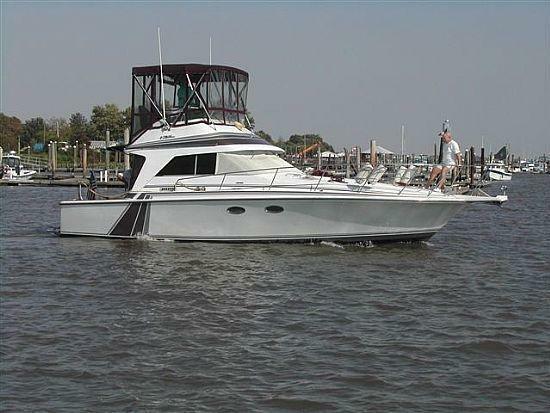 1991 Trojan 10 Meter Mid-Cabin REDUCED $30,000 - THIS SELLER IS SERIOUS - COME SEE HER TODAY!! 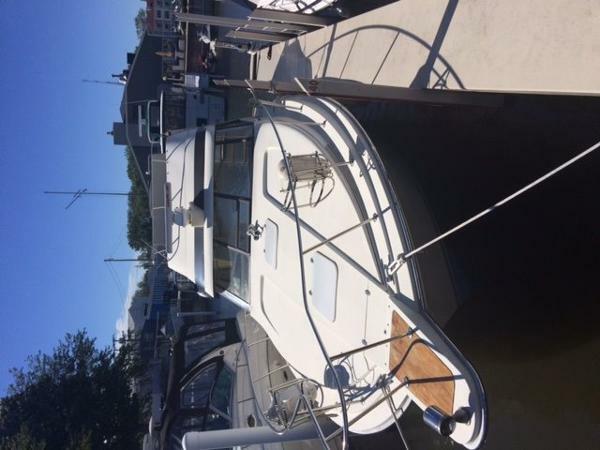 ***OWNER FINANCING AVAILABLE***This 33' TROJAN 10 Meter Mid-Cabin Express Cruiser was one of the biggest express boats built with a wide 13' beam. Her spacious mid-cabin interior includes an L-shaped dinette in the main salon and a convertible u-shaped settee in the mid stateroom. A solid door provides privacy for the bow stateroom, while a curtain separates the midcabin from the salon. Topside, the Trojan's huge bi-level cockpit is arranged with a double helm and companion seat on the bridge deck and bench seating at the transom. A radar arch, swim platform, and bow pulpit were standard. Removable hatches in the cockpit sole provide good access to the engines. A Lot of Boat for the Money! 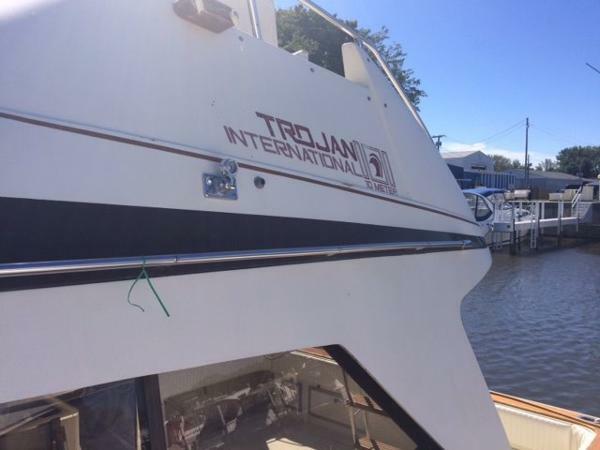 1987 Trojan International 10 Meter This beautiful Trojan 33' Mid-Cabin with full berth, is completely re-fit. New carpet, new electronics, new hot water heater, new hylon fire system, new bottom paint, new isinglass, new stereo system, new vacflush system, new deck upholstery and side boards, new canves!!! She is ready for summer boating fun! Make an appointment to see her! to be added later!